CCRC 5K Run/Walk/BBQ in Clifton Park. Start of the Cherry Blossom 5K Race for ALS in Niskayuna. 2015 Sean’s Run 5K finishers Spencer Winters of Hillsdale, Oliver Noll of Millrift, PA, and Julie Danylielo of Pittsfield, MA. On your spring evening commute home you will suddenly notice: People! Out walking, running, riding, window shopping. Where were they this winter? The urge to don shorts and sneakers and head outdoors is overwhelming. Abandoned New Year’s resolutions resurface and assume an eager pose, filled with joy rather than obligation. This compulsion to move extends to newbies, hibernators and hothouse runners. For the newbies, there are all those health club, race affiliated or Fleet Feet Sports sponsored Couch to 5K programs to temper enthusiasm with caution. Hibernators and hothouse runners, though, tempt the endangered list. Couch potatoes, who transpose fall race times onto spring attempts, and gym rats, whose treadmills do not allow for wind resistance and hard, uneven surfaces are ripe for the injured list. Ease into your 5K training gradually and you too will make it to the start line of the following local 5Ks. 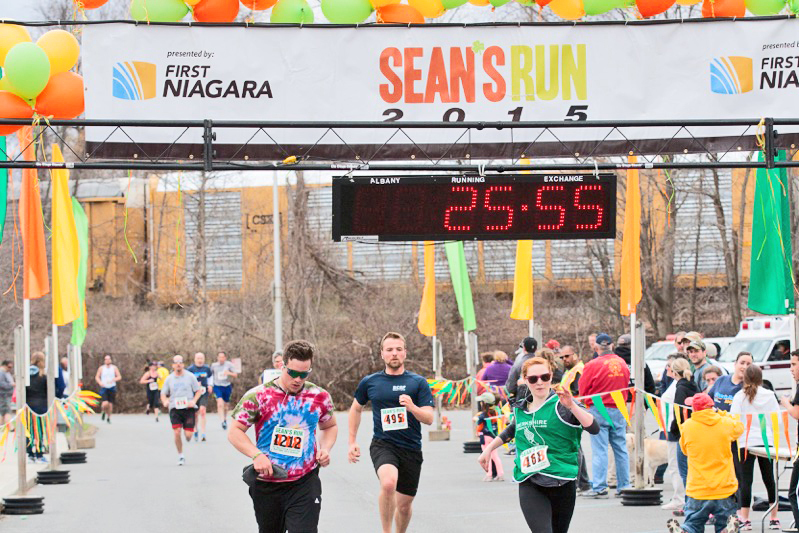 At the start of the lineup is the 15th annual Sean’s Run 5K in Chatham on Sunday, April 24. Voted Columbia County’s Best Spring Community Event, this celebration honors Sean French who lost his life in 2002 when a drunk driver hit the car he was a passenger in. It has grown from the flagship Sean’s 5K Run, to Meghan’s Mile (youth race and shorter walk for all), to the “Battle of the Belts” (a fun seatbelt buckle-up competition), to an entire weekend’s worth of events, with a separate shirt for each day! Go online to view the long-sleeved run/walk shirt, the Saturday bike jersey, and Zumbathon tee. Not often do you have the opportunity to see your top before the race, let alone earn three in one fell swoop! Saturday features Sean’s Ride featuring 10, 25 and 50 mile scenic routes along country roads, Zumbathon, and a free Special Needs Kids’ Run. Both days showcase an expanded food court, exhibits and music. Proceeds benefit youth groups and schools promoting prevention as well as scholarships for graduating seniors. Visit: seansrun.com. Celebrate May Day on Sunday, May 1 at the eighth annual Cherry Blossom 5K Race and 1.5-Mile Walk for ALS at the Congregation Gates of Heaven on Ashmore Avenue in Niskayuna. This is the same Ashmore Avenue that you may have passed enroute to the old Stockade-athon 15K start in Central Park. Familiar territory. What makes this race distinctive is that athletes are encouraged to participate in both the walk and the run, with staggered start times, and a combo registration discount. Plus, you get to see different scenery, with the relatively flat 5K heading off into the residential neighborhood of Old Niskayuna and the walk looping through Schenectady’s Central Park. Afterwards, enjoy the Cherry Blossom Festival with your family. Go to: 5kraceforals.com. The following week, come to the 10th anniversary of the CCRC 5K Run/Walk/BBQ on Saturday, May 7 based from Christ Community Reformed Church in Clifton Park. Any race that includes a full BBQ dinner definitely claims a hungry runner’s attention. Eschewing normal early morning race starts, this event kicks off at 3pm, allowing plenty of time for kids’ sports and family chores. The relatively flat course winds through pleasant Clifton Park neighborhoods, circling the Clifton Commons, and then heading back to the church. Besides the usual age group awards, there are six different family team categories, an early Mother’s Day carnation for all participating mothers, an ice cream certificate and medal to all kids’ 1K fun runners, and a huge array of raffle prizes. Last year every runner won a prize or a raffle. And best of all, there is no need to hurry home and cook dinner or do the dishes! Race director Pat Glover emphasizes, “The goal is to promote healthy lifestyles and family fun, with the emphasis on “participation, not performance.” Proceeds this year are targeted to Things of My Very Own, which provides services and necessities to at-risk children. Check out: ccrc-cpny.org. On Saturday, May 14, head over to the sixth annual Kerry Blue Hustle 5K Race/Walk headquartered at the St. Mary’s-St. Alphonsus School in Glens Falls. The mostly flat and fast route begins on Church Street, includes a portion of the Glens Falls to Lake George bike path, and loops around East Field, including pauses at three water stops. New this year are gender-specific T-shirts for the first 100 entries, including children’ sizes, which are rarely offered at races. Afterwards, enjoy discounts at the many neighborhood restaurants and shops, using your race bib as collateral. Proceeds benefit the school and St. Mary’s Food Pantry. And don’t forget to wear blue in honor of the school’s Kerry Blue terrier mascot! Visit: smsaschool.org. Or, on Saturday, May 14, head over to Schenectady’s Central Park for the ninth annual Joan Nicole Prince Home 5K Run and 1-Mile Walk to benefit this end-of-life facility primarily staffed by volunteers, which offers compassionate care to terminally ill residents in greatest need. The course follows the traditional Central Park 5K loop and also features a mile walk option. All participants are encouraged to pose for free photos to commemorate the event. Afterwards, enjoy a chicken barbeque ($10) and free dessert table, while you relax to live music. Children might also enjoy a session at Central Park’s playground. Go to: joannicoleprincehome.org. Finally, Sunday, May 14 also brings another wonderful offering, the first annual Summer Smith 5K Addiction Awareness Memorial Run at Guilderland High School. This certified 5K course is a mostly flat route, with one small hill, perfect for beginners and speedsters. Launching from high school, it heads out and back along nearby roads. The first 150 registered will be awarded T-shirts for their commitment. This is an important community event as its goal is to support those who are struggling against the growing epidemic of heroin addiction to reach their own personal finish line. From race director, Kristin Hoin, “The race is in memory of my daughter, Summer, who lost her battle with addiction on January 9, 2015, after a 12 year battle. She is survived by her three children, 5, 6 and 14.” Proceeds will benefit the Addiction Care Center of Albany to assist with community education, and the Schenectady YWCA to help a woman in recovery with her housing needs. Check out: summersmith5k.com. Whatever profile you fit this winter, newbie, hibernator or hothouse, the 5K is an equal opportunity entry point, accessible and doable whatever your current level. Run experimentally as a novice, tentatively as an emerging hibernator, or gung-ho as an overly confident year-round contender. See you at the races! Laura Clark (snowshoegal33@gmail.com) of Saratoga Springs is an avid trail runner and ultramarathoner, snowshoer and cross-country skier. She is a children’s librarian at the Saratoga Springs Public Library.